Oops! Inflation was remarkably weak in the June quarter at just +0.18 per cent, the softest inflation result for the second quarter of the calendar year since 2003. Thus, not only is core inflation tracking below the target 2 to 3 per cent range, now headline inflation is too, at just +1.9 per cent. 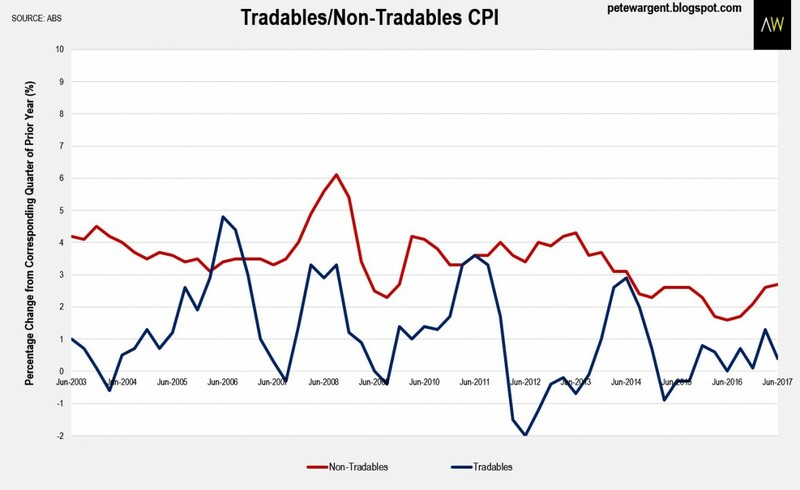 To be fair, though, here was another moderate annual increase in non-tradables inflation – a proxy for domestic price pressures – so the inflation pulse arguably still at least has a…erm, pulse. As widely expected, automotive fuel prices pulled the headline result down in the quarter. 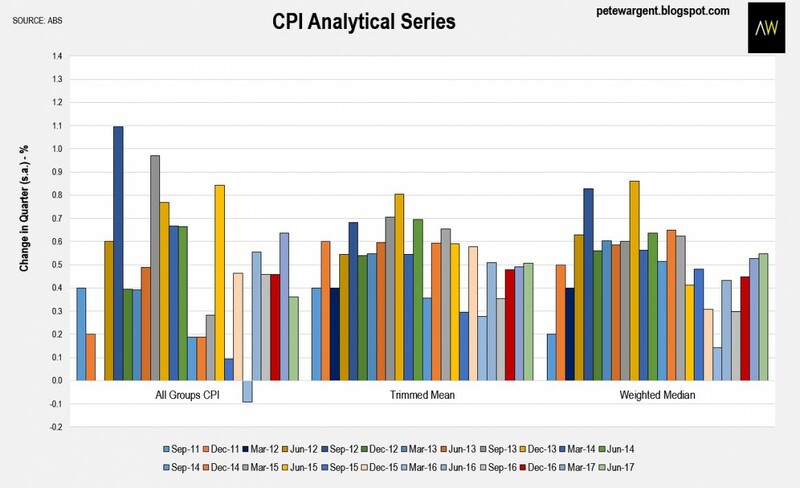 Looking more closely at the seasonally adjusted and analytical series, both of the core measures came in at +0.5 per cent for the quarter, although the weighted median was within a hair’s breadth of being rounded up to a +0.6 per cent reading. Over the past year both core measures came in at just +1.83 per cent and +1.84 per cent respectively. Other soft spots for inflation included the intensely competitive clothing and retail sectors. Many readers of this blog have a good deal of interest in the housing market, so let’s have a quick shufty at what’s happening to rents around the traps. 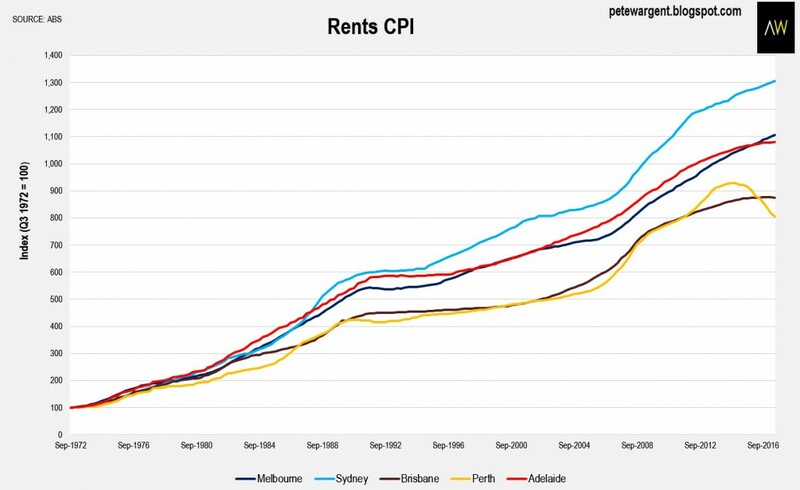 Annual rental price growth remains weak at just +0.6 per cent as a weighted average of the eight capital cities, which is the equal lowest level in 23 years, a direct consequence of the building boom combined with record numbers of Mum and Dad landlords. There were some wild variations around the capital cities, however. 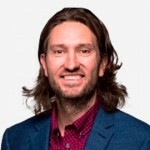 The headline result was impacted heavily by increasingly sharp year-on-year declines in Perth (-8.1 per cent), and another weak result for Darwin (-7.2 per cent). 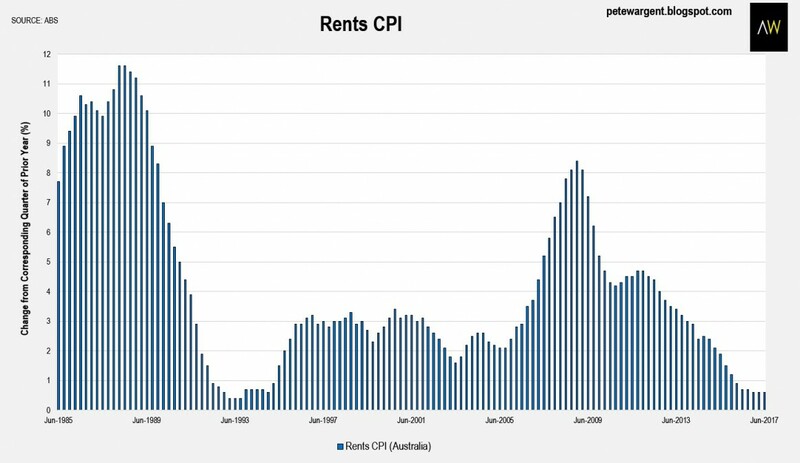 Brisbane rents were only flat over the past year as the impact of the inner city apartment oversupply threatens to ripple through to the wider apartment market. There was a much juicier +4.2 per cent annual increase in rents in the tight Hobart market down in resurgent Tassie. 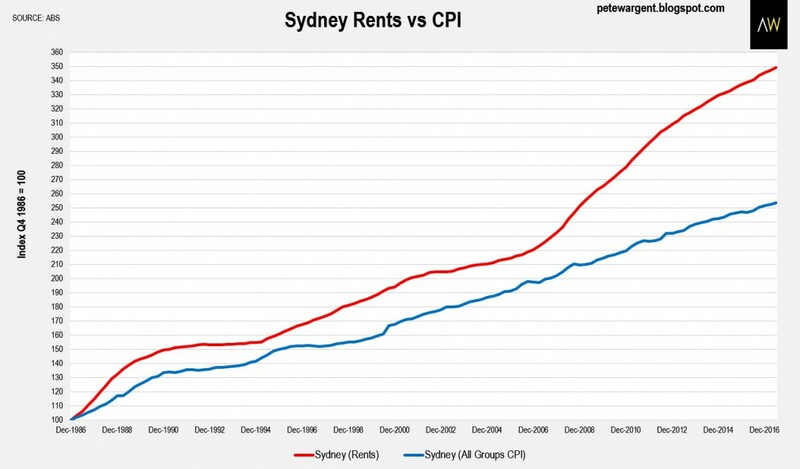 In Sydney, rents (+2.5 per cent) continue to comfortably outpace inflation, and indeed over the past decade rents in the harbour city (+54 per cent) have increased by exactly doubled the growth in the index for all groups CPI (+27 per cent). 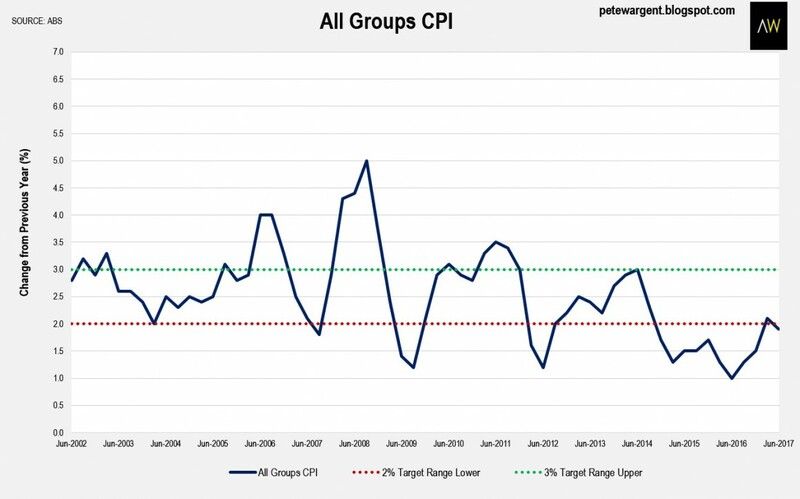 Overall, it was a stunningly low inflation result for the headline inflation figure, which should keep the interest rate hawks in check for now. If you look more closely at the analytical series, though, you could arguably make the case that the weighted median inflation figure is gently drifting back towards the target range, while the annualised trimmed mean figure was essentially flat when you drill in to an extra decimal place. 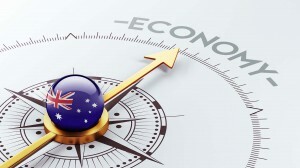 With several indicators of improvement in the economy, and with the Reserve Bank’s own inflation forecasts suggesting that the middle of the target range will be hit sometime around the middle of the next decade, we could well be in for a loooong period of rates on hold.